06 Feb The Santa Eulalia Festivity: Have fun! 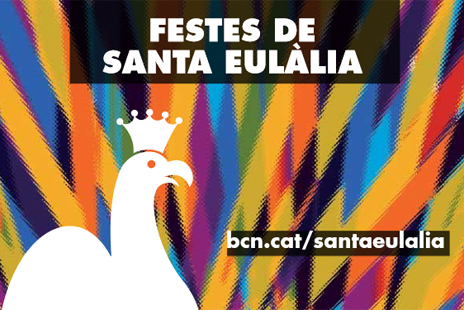 The Santa Eulalia festivity is the largest winter festival of Barcelona starting the 6th until the 15th of February. The streets of Ciutat Vella and, above all, La Rambla, are filled with giants, devils, big heads, castellers, dances and other elements of popular culture. Parade of the XII Meeting and sample of giants. Route: Plaza de los Angeles, Street Los Angeles, Pintor Fortuny, La Rambla, Ferran Street and Plaza Santiago. Presentation of Barcelona’s Stick Dance. Route: Portal del Angel, Arcos Street, Nueva Square (12.30h), Obispo street, San Severo Street, Santa Eulalia Street, Banys Nous Street, Avinyó Street, Ferran Street and Santiago Square. “Los latidos de Laia”: 4th Meeting of Drummers. 1st parade starts at 17.10 h at Plaza del Rey and finishes at La Rambla at 18.15h. 2nd parade starts at 17:20 h at the same place but following another route and they will meet up at La Rambla at 18.15h. Correfoc (fire-runs) of the Little Devils. Starts in La Rambla and finishes at 19.45h at Santiago Square. BE CAREFUL!! THERE’S REAL FIRE, and it’s always recommended to wear a hat, a scarf, long sleeves and comfortable footwear trying to avoid synthetic materials. Do not throw water during the parade and be especially careful if going with children. In the morning, the music of the “Grallers” parading through the streets of the Gothic Quarter reminds you that the city celebrates the festival of winter. Procession at 11 h starting at Plaça Reial. Starting the parade at the Palau de la Virreina. Do not miss the festivity! It’s a really good chance to know Barcelona’s culture.